"This recipe has an Italian coastal flavor. It's a good first course. Serve with a rustic bread." In a medium saucepan, cover the potatoes with cold water. Add salt, and bring to a boil. Cook until tender, about 15 minutes. Drain. Bring a saucepan of salted water to a boil. Add the broccoli rabe, and cook until just tender; it should be bright green. Drain well, and cut into 2 inch lengths. Combine the oil, anchovies, and garlic in a large, deep skillet. Cook over high heat, mashing the anchovies, for about 1 minute. Spread the mussels in the skillet, top with the potatoes, broccoli rabe, and chopped parsley. Add 1/2 cup water, and season with salt. Cover, and cook until mussels are open. Serve. See how to make a simple, flavorful vegetable and sausage stew. I made a half recipe of this, and substituted white wine for the added water at the end. Quite tasty, and very simple to make. I'd consider adding some fresh dill or fennel next time. This meal is great w/ a loaf of french bread and friends. I added onions to the anchovy, garlic, and olive oil. This was ok, but wasn't that great. Adding chicken stock and wine did improve the flavour, but it didn't feel like a proper stew. I love Mussels and I love broccoli, but together they just didn't seem right. 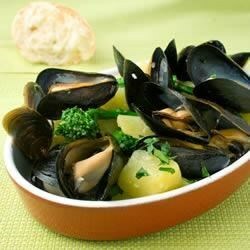 The mussels were delicate, the potatoes tender and sweet, and the broccoli rabe added a tinge of sharpness to the stew. Delicious!